The warehouse giant's operating trends are stronger than they first appear. Costco's (NASDAQ:COST) latest quarterly results were unusual in that, for the first time in over a year, earnings came in below Wall Street estimates. The warehouse giant posted a decline in profit -- down to $1.03 per share from $1.06 per share -- compared to consensus estimates for a $0.05-per-share increase. Sales growth was also light as reported comparable-store sales actually shrunk by 1% after climbing slightly over the preceding 12 months. However, there was a lot more to Costco's quarterly results than just those seemingly weak headline figures. Here are three of the biggest points that investors may have missed in the retailer's fiscal Q1 announcement. First, the underlying sales and profit growth figures were much stronger than they appeared at a glance. In the earnings conference call, Chief Financial Officer Richard Galanti outlined six one-time events that combined to remove a significant slice of the retailer's earnings. Sure, these included foreign exchange rate swings, which analysts likely considered in their estimates. But profits were also hit with several smaller things like regulatory and legal charges, hardware technology spending, and losses tied to Costco's transition to a new exclusive credit card. Altogether, these issues affected earnings by $0.27 per share, easily flipping its $0.03-per-share decline into a substantial profit gain. A similar story holds for revenue growth, where Costco's negative 1% reported comparable-store sales decline becomes a 6% gain after accounting for gas price deflation and foreign currency swings. That pace matches the stellar adjusted growth rate it reported in the prior quarter. The key takeaway here is that sales and profit growth trends remain strong, even if reported figures paint a different picture. Store expansion is one of Costco's main strategies for keeping that positive momentum going. Management targets opening 32 new locations in the fiscal year that ends this August, for a significant boost over last year's 23-store increase. In fact, if all goes according to plan, this will be Costco's biggest growth year in recent memory, beating the 31 locations it added in 2007. Launching warehouses at that pace is expensive, which is why investors can expect to see a huge boost to capital spending in fiscal 2016: Costco will likely plow $3 billion into its business this year, up from a $2 billion annual pace over the past three years. Image source: Costco 10-K report. Those new stores will be a drag on financial results for some time after they open. 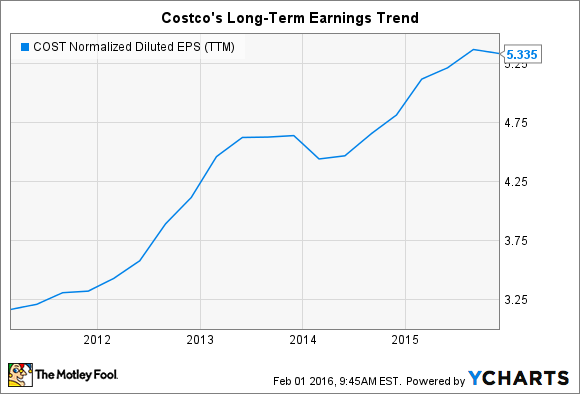 But as the above chart shows, they are among the best long-term investments that Costco can make. Average annual sales at brand-new locations were just $83 million last year -- but that figure doubles to $177 million for mature warehouses that have been open for 10 years or more. 2016's freshman crop of stores is a down payment on decades of future sales gains. Because Costco is more of a membership club than a retailer, its subscriber metrics are what really matters to its long-run operating success. Checking in with those figures reveals continued strength this quarter. Membership fee income rose a healthy 6%, after adjusting for currency swings, and Costco logged steady growth across its geographic markets, adding a total of 0.8 million paid memberships to reach 45.5 million. The renewal rate held steady at a record high 91% in the United States and 88% worldwide. For the past seven consecutive years, Costco has posted market-crushing customer traffic growth of about 4% a year. That awesome growth can't continue forever, and in fact it slipped down to roughly 3.5% this quarter. Yet that slightly lower number still trounces the healthy 2% average growth pace that Costco enjoyed in the 20 years prior to 2009.